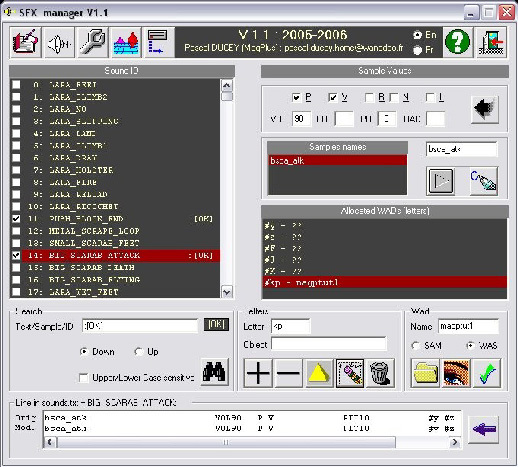 SFX Manager is a tool made to fix sound bugs in your wad. If you use Trwest or Wadmerger and encounter missing or bad sounds, you should try this tool. See below for an example. With a few clicks, you can add/remove sounds to your Wad, modify the "sound.txt" file and generate the corresponding SAM and SFX files. You can also change samples values, rename samples and play them. A backup of the original "sound.txt" is made to let you restore it for each new wad you create. By this way, you can assign always the same letter to each different wad. You can choose which file you want to load: SAM file containing the samples list, or WAS file containing objects list. It's time to open SFX Manager. You simply type a non used letter and the name of your wad. Then you simply click on the folder icon below. Every sound listed in your wad is automatically applied as are all the general sounds too. No need to add them with Wadmerger one by one. After that, with only 2 clicks, you apply the changes to the sound.txt file and finally launch the SFX generator. 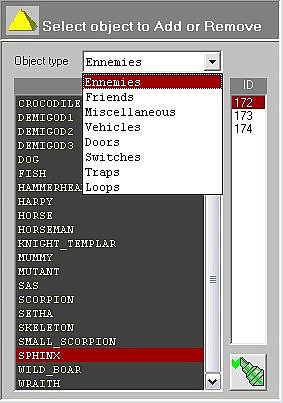 Select an object by category (enemy, friend etc). Original sounds associated to the object are listed, and the name of the object is displayed in the main window. You can then add or remove all the sounds in one click.